Imagine your self as a spring bulb, planted last fall, given some food, covered up and told to go to sleep for four to five months. Now you have finally woken up after a long winter's nap and started growing. Wouldn't you be very, very hungry right about now? Of course you would! This is the time to get some good quality bulb food and feed your daffodils, tulips, hyacinth and other spring blooming bulbs. There are several good options on the market, such as BulbTone, or even just good old bone meal; just follow the package directions. Depending on the species, you will reap future benefits of this early spring feeding as the plants grow and bloom. 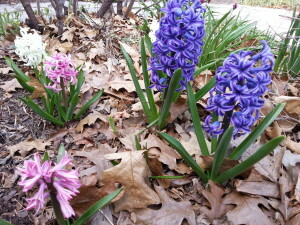 Your bulbs will remain healthy and strong year after year. Many will even divide and create new bulbs as a result of good healthy feedings. Daffodils, in particular, will thrive and spread for many years with regular feedings. So get out there and feed your bulbs!